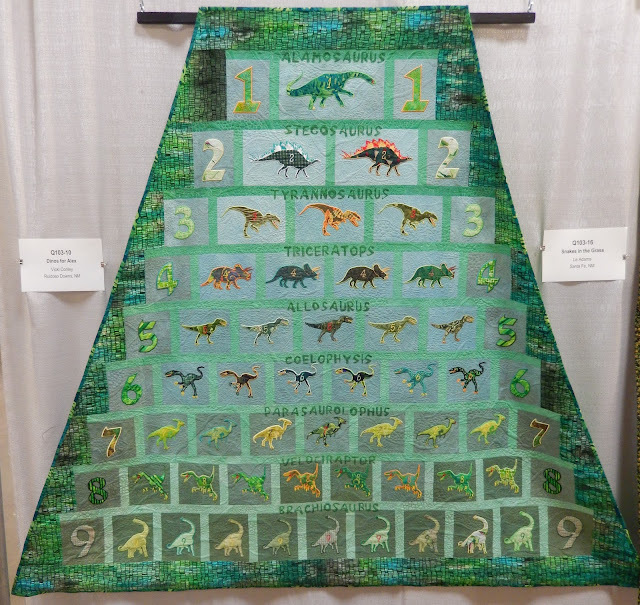 Over Memorial Weekend, the Albuquerque Fiber Arts Council hosted the biannual Fiber Arts Fiesta. Today, I'd like to show you a few of my personal favorites. 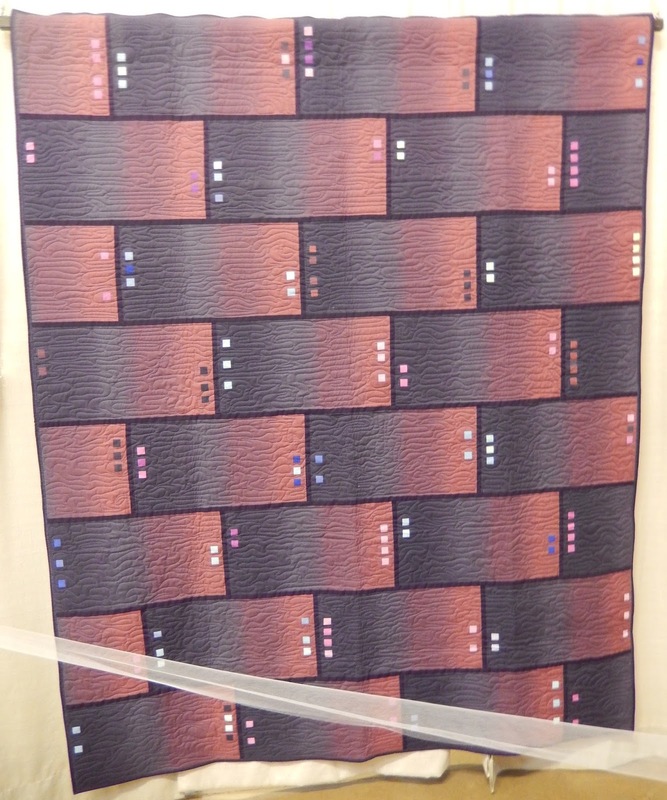 Benee's In the Style of Gee's Bend is an adaptation of the "Work Clothes" pattern, and uses Waverly fabrics and a variety of stitches on a home machine. Timberline Log Cabin is beautifully pieced, and the colors are scrumptious. 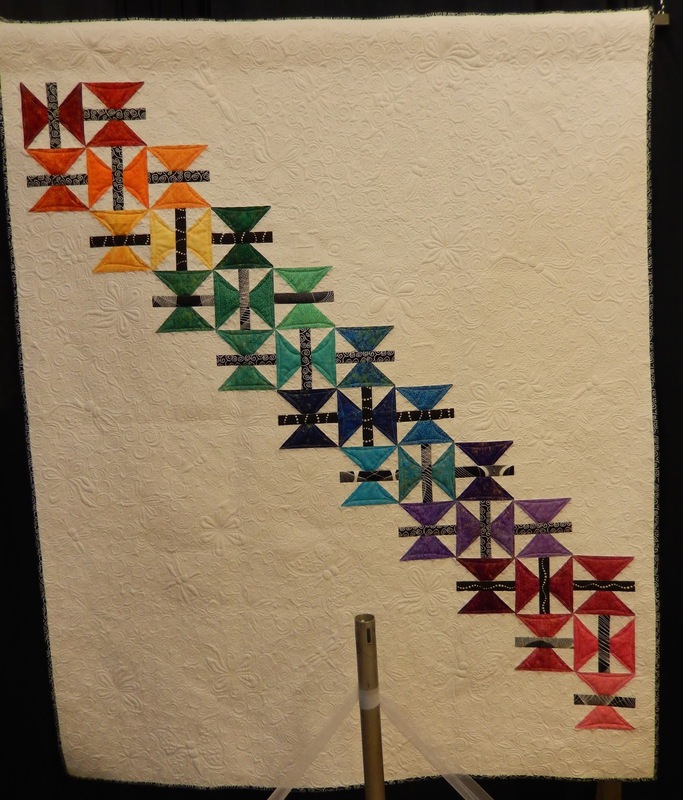 The design is in Judy Martin's Log Cabin Quilt Book. As I regularly get quizzed by my son about the Dinosaur Train alphabet song, I can appreciate this stratified counting quilt. Vicki digitized appliqués using embroidery software. Kathryn Guffey very successfully combined the Hope Takes Flight pattern with free motion templates from Judi Madesn's Quilting Wide Open Spaces. Kathy Sublet used ombre fabric in a very modern way within Warm Floorboards, an original design and gift for her husband. Chambord Fantasy, an original design by Jackie Manley, was inspired by the turrets and towers of Chateau Chambered. The glowing color scheme with a contrasting background really draws attention. Hmmmmmm. Are You Here for Breakfast is an original design by Theresa Halbert. According to Theresa, "Dragon face and chickadee hair are bead embroidered. Dragon face of found fabrics to create texture is hand-sewn to sculpt face." 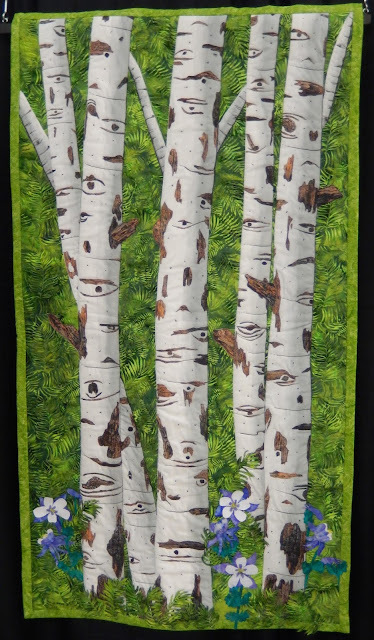 Columbines Among Aspens is an original design by Karen Preston with raw edge and turned appliqué, thread painting, dye pen, machine quilting, and 3-D elements. Shannon Conley of I'm Working on a Project created Gloria Patri using original silk screens, free-motion quilting, and painting. Kathryn's first attempt at quilting letters is quite impressive. Judy Murphy of Quilt Paradigm had a couple quilts in the show. She introduced herself when I was working at the Albuquerque Modern Quilt Guild booth. 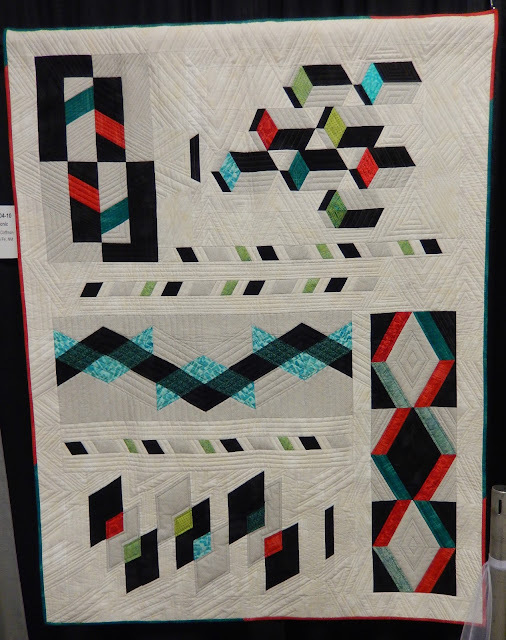 I hadn't seen Lynne Horpedahl's rendition of the Picnic pattern by Modern Quilt Relish since the NNMQG Quilt Fiesta. It was good to revisit. 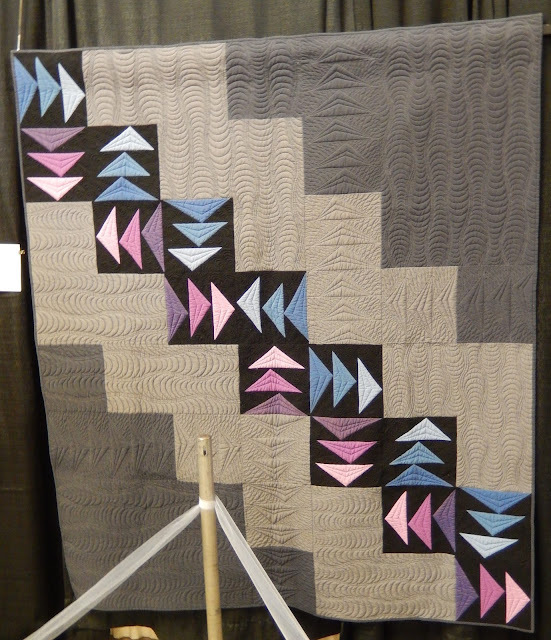 Afton, thanks so much as always for the quilt show recaps. I didn't get to go to Fiber Arts so it's really cool to see some of what was there. I'm really glad you liked the dinosaur (and mine too of course), the dinosaur one is my mom's and we had so much fun picking out the dinosaurs for it! Also, my mom had taken a few pictures (so I'd seen the small one that won best of show), but I hadn't seen many of the others. I'm not usually a traditional quilter, but that Timberline Log Cabin is really really fabulous! Something about the colors and pattern really appeals to me. Dinos is fun, and Hope takes Flight and Warm Floorboards are great and I love, love, love the colours in Off Course. 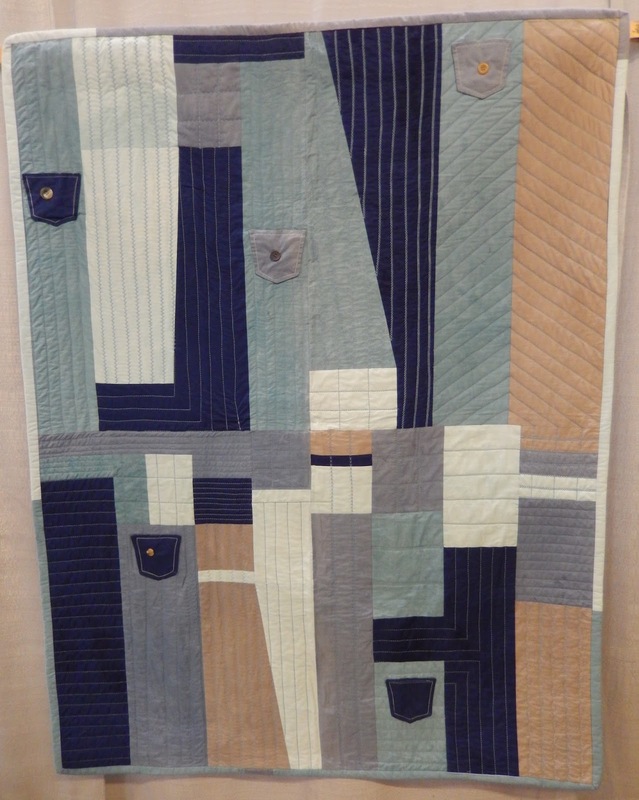 Thanks for showing us these quilts.